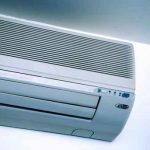 Air conditioners are one of the most convenient devices we use today to keep cool, but they come with a cost of which many justify for their comfort. If you live here in Brisbane, you will know that the majority of the discomfort in summer is due to the humidity. Have you ever wondered what the water drop symbol is on your air conditioning controller? Most new air conditioners are equipped with a dry mode function which removes the humidity from the air, running the compressor at a reduced speed, saving on energy consumption. When running on dry mode the air from the space passes through the air conditioner and the water vapour condenses on the evaporator. The dry air that is formed then flows back into the space which efficiently lowers the humidity to a comfortable 60%. Cool mode and dry mode work almost similarly in that if the thermostat is set at 24 degrees, the air conditioner will work to achieve this temperature. In dry mode the fan will run to draw in the air and the compressor will turn on to help the condensation of the humidity. When the space has reached 24 degrees the fan and compressor will stop. In cool mode, when the temperature reaches 24 degrees the compressor will stop but the fan continues to run. Dry mode does not cool the room as such, the cool feeling comes from the removal of excess moisture within the space. By using dry mode on your air conditioner you can not only feel comfortable, but for less! For all your air conditioning installations, repairs and servicing call SJK Electrical & Air on 07 3870 9893. This are one of the best energy saving tips I have come across. Air Conditioning is the main reason in getting the power bills high and we are always trying to save it in many ways. The tips provided above are very useful. Would surely share it with my friends as well. Excellent post. Many people aren’t aware of the dry mode function. Schedule a spring maintenance tune-up for your air conditioning system. This will ensure your system is ready to perform reliably and efficiently throughout the spring and summer. We service all Brisbane suburbs. *Free quotes are for new installations only (no investigation works).